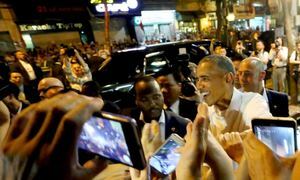 Vietnam and the U.S. have laid out the future for their cooperation in politics, diplomacy, trade, defense, people-to-people ties, human rights, legal reform and maritime security in Vietnam's East Sea during Obama's visit in Hanoi. 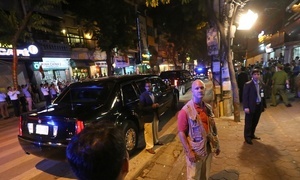 According to a joint statement made yesterday by Vietnamese President Tran Dai Quang and U.S. President Barack Obama, bilateral relations have contributed to their joint efforts to maintaining peace, stability, cooperation and respect for international law in the region, and building a rules-based region. 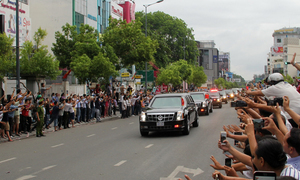 Both sides noted with satisfaction the growth of Vietnam-U.S. relations over the past year, guided by the U.S.-Vietnam Comprehensive Partnership of 2013 and the Joint Vision Statement issued during the historic visit to the United States by General Secretary of the Central Committee of the Communist Party of Vietnam Nguyen Phu Trong in July 2015. Together, both countries are addressing regional and global challenges, including climate change, sustainable development, global health, non-proliferation of weapons of mass destruction, peacekeeping and wildlife trafficking. The United States and Vietnam have committed to strengthening and developing the ASEAN Community, and to working with the international community to respond to global challenges. Both sides pledged to continue to exchange delegations at all levels, especially high-level delegations, and to strengthen dialogue between agencies of the two governments. The two sides also intend to expand annual high-level dialogues between their two foreign ministries to discuss measures to strengthen the comprehensive partnership and discuss other issues of mutual interest. The two countries resolve to focus on fostering economic cooperation in trade, investment, science and technology, human resource training and climate change. The two sides stated that the Trans-Pacific Partnership (TPP) is economically and strategically important, and will promote trade and investment, accelerate inclusive economic growth and create jobs. They reaffirmed their commitments to seek early ratification and full implementation of the agreement, including commitments on investment, business facilitation and development, intellectual property, textiles, services, labor and the environment. The United States pledged to support Vietnam through robust technical assistance and capacity-building programs to effectively implement and meet the high standards of the TPP. They also reaffirmed their commitment to ensuring economic growth is inclusive and creates opportunities for everyone, which is furthered by fostering innovation, entrepreneurship and sustainable economic development. Both countries pledged to promote bilateral trade and investment, and will continue to work towards access for industrial, agricultural and aquacultural goods. The United States and Vietnam are committed to consultations through the enhanced bilateral working group in a cooperative and comprehensive manner regarding Vietnam’s desire to be recognized as a market economy. They welcomed the conclusion of major commercial deals on the occasion of the visit, such as VietJet’s purchase of 100 Boeing aircraft and Pratt & Whitney engines, as well as a wind energy MOU signed between GE and the Vietnamese government. Both sides affirmed their support for the enhancement of people-to-people ties to strengthen mutual understanding, cooperation and friendship between the two peoples. The United States welcomed the Vietnamese government’s approval of the Peace Corps offer to teach the English language in Vietnam. The United States and Vietnam hailed the establishment of the Fulbright University Vietnam, which will be a world-class Vietnamese university. They welcomed the bilateral arrangement granting one-year, multiple-entry visas for short-term business and tourism travelers from both countries. They also highly valued and recognized the success of the Vietnamese-American community and their contributions to the promotion of bilateral ties. The United States and Vietnam reaffirmed their commitment to strengthening defense cooperation between the two countries, giving priority to humanitarian cooperation, the aftermath of the war, maritime security, peacekeeping, humanitarian assistance and disaster relief. Both sides reiterated they would continue to strengthen cooperation in the fields of security, combating transnational and cyber crime. 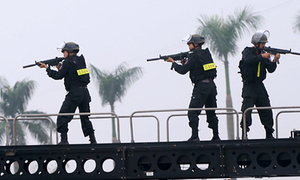 Vietnam welcomed the U.S. government's decision to fully lift the ban on the sale of lethal weapons to Vietnam. Vietnam also welcomed U.S. maritime security assistance – including through the Maritime Security Initiative (MSI), the Cooperative Threat Reduction program, and Foreign Military Financing – and looks forward to working with the United States to enhance Vietnam’s maritime capabilities. The United States and Vietnam signed a letter of intent to establish a working group for the Cooperative Humanitarian and Medical Storage Initiative (CHAMSI), which will advance cooperation on humanitarian assistance and disaster relief. The United States reaffirmed its support for Vietnam’s peacekeeping efforts with the aim of assisting Vietnam’s first deployment of UN peacekeeping forces by 2017. Both countries expressed their satisfaction with their joint efforts to advance humanitarian efforts and deal with the legacy of the war. In particular, the United States valued Vietnam’s cooperation with repatriating U.S. personnel still missing from the war. Both sides committed to continue their cooperation on unexploded ordnance removal. Vietnam welcomed cooperation leading to the successful conclusion of the first phase of dioxin remediation at Danang International Airport, with the final phase already underway. The United States also committed to helping Vietnam clean-up the dioxin contamination at Bien Hoa Air Base. Both countries pledged to continue supporting the promotion and protection of human rights in conformity with their own constitutions and respective international commitments. The two countries welcomed the results of positive, frank and constructive dialogues on human rights, especially the 20th round of the U.S.-Vietnam Human Rights Dialogue in April 2016, which helped to narrow differences and continue to build trust. 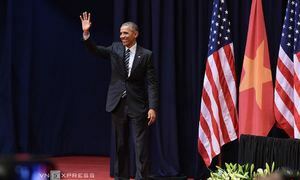 The United States welcomed Vietnam's ongoing efforts to improve its legal system and undertake legal reform in order to guarantee human rights and fundamental freedom for everyone in accordance with the 2013 Constitution. Vietnam informed the United States of its plan to revise, amend and draft new laws, including the Law on Religion and Belief, the Law on Association, the amended Law on Legal Aid, the amended Law on Legal Record, and the Law on the Promulgation of Administrative Decisions. Both sides recognized the contributions that social and religious organizations continue to make in the fields of education, healthcare and social services in both countries. They encouraged further cooperation to ensure that all people – regardless of gender, race, religion and sexual orientation, and including people with disabilities – fully enjoy their human rights. 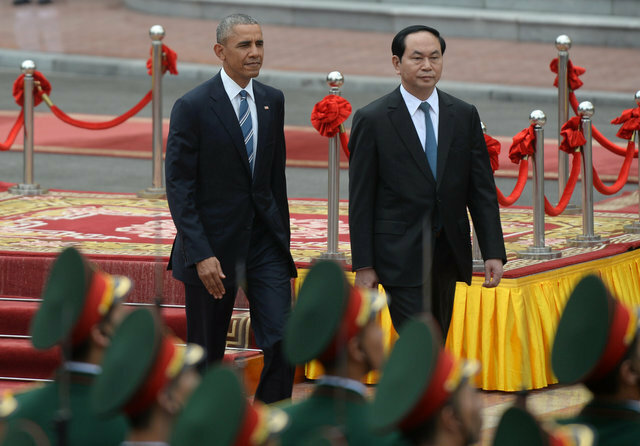 The United States and Vietnam welcomed a letter of agreement on law enforcement and justice sector assistance. The United States and Vietnam reaffirmed their shared commitment to the peaceful resolution of territorial and maritime disputes, including full respect for diplomatic and legal processes, without resorting to the threat or use of force in accordance with the UN Charter and international laws, including the United Nations Convention on the Law of the Sea (UNCLOS). Both countries underscored the commitments of parties involved in the disputes to refrain from actions that aggravate or broaden them and recognize the importance of strictly implementing the Declaration on the Conduct of Parties (DOC) and working to accelerate negotiations with substantive results toward the early conclusion of the Code of Conduct (COC). Both countries recognized the imperative of upholding the freedom of navigation and unimpeded lawful commerce in the South China Sea (Vietnam's East Sea), called for non-militarization and self-restraint in addressing disputes, reaffirmed shared commitments under the Sunnylands Declaration, and committed to working closely with other ASEAN partners in implementing that declaration. 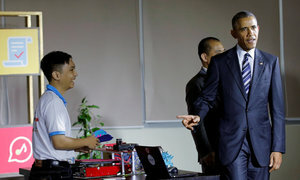 The United States reaffirmed its commitment to coordinate with and support Vietnam's hosting of APEC 2017. The United States and Vietnam reaffirmed their commitment to addressing climate change and implementing the Paris Agreement. They shared a desire to see the early entry into force of the agreement, and are both committed to formally joining the agreement in 2016. The United States and Vietnam pledged to take a number of practical actions to advance climate mitigation and adaptation, as well as enhance transparency and capacity building in the U.S.-Vietnam Climate Partnership, including in the Mekong River Delta. Future work will build on the results of collaboration between the United States and Vietnam in implementing programs under the Lower Mekong Initiative. The United States pledged its continued support for Vietnam in responding to the latter’s worst drought and salinization in over 90 years, and in advancing sustainable economic development in the lower Mekong basin. As a development partner of the Mekong River Commission (MRC), the United States expressed its commitment to supporting cooperation among MRC members and between MRC members and other regional mechanisms in using, managing, and developing trans-boundary water resources in an effective and sustainable manner. 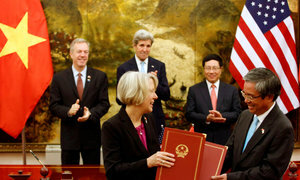 The two countries expressed support for an expanding civil nuclear partnership as they seek to reduce emissions from the global power sector, the signing of the Administrative Arrangement under the U.S.-Vietnam Agreement for Cooperation in the Peaceful Uses of Nuclear Energy ("123" Agreement), and the highest standards of nuclear safety, security and nonproliferation. Both countries welcomed the successful outcomes of the 2016 Nuclear Security Summit and pledged to continue to work together to strengthen the global nuclear security architecture. The two sides intend to establish the U.S.-Vietnam Joint Commission on Civil Nuclear Cooperation to facilitate the implementation of the 123 Agreement. The two countries committed to sustain their successful cooperation and joint leadership under the Global Health Security Agenda (GHSA), particularly with respect to collaboration on emergency operation centers and outbreak detection and response in humans and animals, as well as the implementation of a national roadmap to achieve each of the GHSA targets. The United States pledged its support to improve Vietnam’s capacity in coastal medicine. The United States and Vietnam committed to work together regionally and globally to prevent, detect, and respond to epidemic threats, and both countries will undertake a joint evaluation of these efforts in 2016. Both countries also reaffirmed their commitment to combating wildlife trafficking and protecting biodiversity under the new U.S.-Vietnam Partnership to Combat Wildlife Trafficking. Both sides agreed to further enhance the U.S.-Vietnam Comprehensive Partnership, making it deeper, more substantive, and more effective in order to better serve the interests of the two peoples for peace, stability and cooperation in the region and the world.